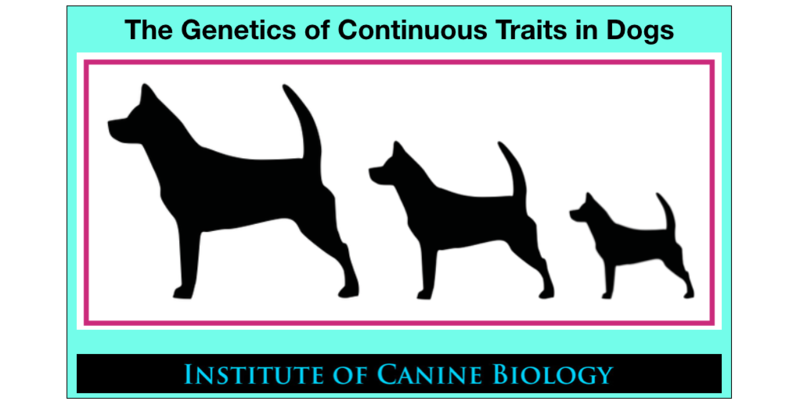 Analysis of genes for body size using dogs owned by students in the course. The course is approximately 6 weeks; fee is $99. After you register, you can sit in on the course again as many times as you want. Generally there will be 3-5 hours of reading and homework exercises each week. You can work with the class or at your own pace. There is no class meeting time - materials will be available to you 24/7 through the course website. The course is held entirely online. We will have a private Facebook group where we can discuss and ask questions, so you need a Facebook account. You can live anywhere in the world; all you need is an internet connection. We will be using Embark genotype files from students in the course where available. This is a data file that can be downloaded from the Embark website for each of your dogs. All other course materials will be provided. You just need Internet access to reach the course website, where you can access the reading each week and quizzes to test your comprehension. Refunds are not available after the first week of the course.